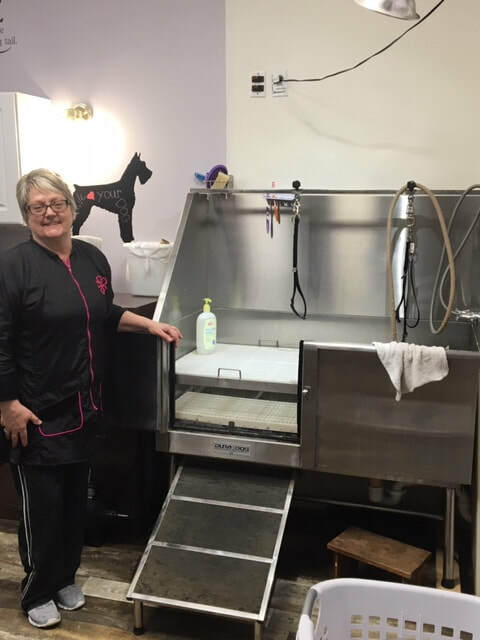 Julie Thomas, owner of Cut-N-Cuddle, a dog grooming business on 322 S. Brook Street here in Francesville, is a beautician for dogs! Her business first started with a few local pets being groomed in the kitchen of her and her husband Tom. She soon moved to grooming dogs in the garden tub off their master bathroom, where she could actually climb into the tub with her shorts on and hand groom each dog! Since this really wasn’t an ideal location, she moved the operation into their basement. 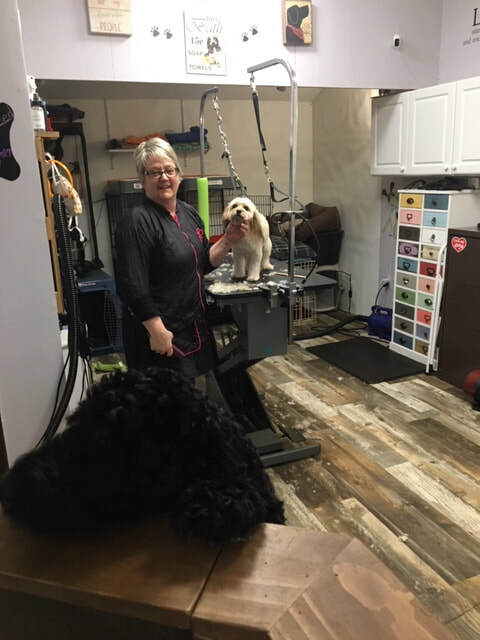 Concern for her human clients needing to walk up and down stairs, was a motivation to convert her tanning salon,Tanning Shack, housed in their garage, into a dog grooming salon. What was once a part time job flourished into a full-time business with a waiting list of prospective clients. Julie says the best part of her job is seeing the look on the dog owner’s face after the first grooming. Everyone is usually delighted, including the dog, as it is aware of its’ owner’s pride. She perceives that the dog can sense when they look good or bad. Julie states that each dog has its own personality and grooming can reflect that personality. Julie gets to know each dog and its owner personally and looks forward to their visits. The worst part of her job is when a dog owner calls to cancel an appointment due to a loving pet having passed away. Open five days a week and one Saturday a month, Cut-N-Cuddle begins the day at 9 A.M. with the last appointment starting at 3 P.M. Julie has evening hours only by special request. Each session is by appointment only. She is not taking new clients at this time, but has a waiting list. For information about the business, contact Julie at cutncuddlegs@gmail.com or 219-863-3368.